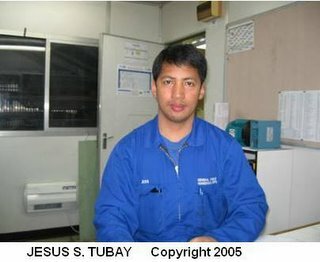 trip at MakBan Geothermal Plant in Laguna, it just appeared blue on the photo). on shirt button wearing pink collared-shirt), Ernesto Villanueva(on brown polo shirt over white shirt), Gil Gomez(on White collared-shirt with blue stripes on indigo jeans and white rubber shoes), Dennis Madamba(aka Kukang graduating October 1992), Arthur Lenin Garcia(on turtleneck shirt holding a camera), Ferdinand Bumagat(with a tickler on his lap while Arthur Lenin's hand is over it with one of his hands on Arthur Lenin's shoulder),John Aquino(on rayban sunglasses with one hand extended to the sides pointing sign). Alex Dizon(with blue towel on right shoulder). ,another guy I forgot his name... his face is covered by Rolly's visor cap ,Rolly Galinato(wearing visor cap on white t-shirt) ,Olivia Serrano(the only rose among the thorn) ,a guy's profile at the farback(I don't know who it was) ,Peter Paul Ocampo(with hands on the pocket of his jeans) ,another guy I forgot his name standing on his back face hidden. From Edgar de la Cruz: i wasthe one taking the photos, if you remember.... hi george! From George Palaganas: I can't exactly recall now...LOL! it's been 19 years... a baby at that time will have his own babies today... I thought the camera was Olive...'s... do you have other photos of the field trip? From George Palaganas: The camera was Olivia Serrano's, right? and you just volunteered to take the pictures. I recall now, when you said, "Ako naman!"(Hey! Can I have my turn?)... LOL! From Edgar de la Cruz: haha... you're funny george. But, no. I was the pres of that batch so one of my "official" functions was to take photos. Also after each visit I was with Enr. Passion filling out forms or signing papers. You can ask Dante River or Arthur Lenin. If the camera was Olive's I can't recall because there were 4 or 5 of them. Good night George. 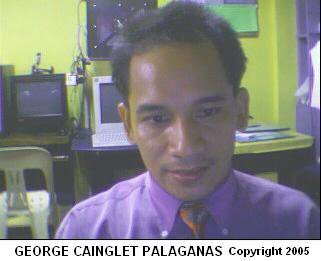 From George Palaganas: Yah... remember that I am the Vice-President of that batch.... and if you can't recall it properly(the camera), I can not blame you for it's been a long time... do you have still contact with Elmer? Hi Jess! Greetings of peace and joy! Aren’t you going to greet me too on my birthday? I am exactly 37 years old today! Life is so fast we can’t miss what we’re soakin’. I appreciate the two pictures you sent below. I was almost crying for I got an exact semile. Regarding Cindy’s pictures, I can’t remember any except the one on the lobby with four us, you, Dante Sumaoang, Nilo Flores and I. The four of us are on an old Cindy’s orange uniform with the three of you ,visor cap on, while I got my head gear on my hand. The backdrop was a modern art blown up picture of blue and red paint with two giant brushes and the huge picture was neatly framed on the wall. I have plenty of pictures spread all over the net. Obsession is a perfume and it’s weird I have also rented a car in Oslo. Calgary reports me on a bad AVIS car wreck and whoever reported that, dapat ihulog sa mga bangin don. Maybe because directly from the plane, I went straight to Richmond Hospital in Richmond,British Columbia. And I took my Westjet flight from Calgary under a government program called Project Isabela . Obviously it’s from that notion where they base those rumors. LOL. Jess, I am sending you some postcards on regular mail so where can I drop my mails now? You can write regular mails to me at 846 Aurora Boulevard, Kaunlaran 1109 Cubao, Quezon City. You must be amazed. The last time we have seen each other is at the Metrostar train station last year. As what I told you, I am just living around the corner. And it’s sad we have very little time to talk. Alright, so keep on writing to me and I’ll be keeping in touch with you. Iggy has still to respond to my e-mails. Has he sent you already any? Hi, Jess! I am glad you have leisure times on the chesspark in your area for that’s a great thing to do. I know how you are very fond of chess and I can still recall how you and Iggy beat everyone to the hilt on that game. It’s like playing crib and you end-up as skunk, that’s what everyone feels everytime they play the game with the two of you. That area of your’s is similar to Granville Island’s in Vancouver where the show is mostly Asian revelry. If you will click the hypertext you will see that they have pictures but it wasn’t the same as the Granville Island in the British Columbia that I have been. And the boats are not also on that area but they are all clustered in the Kerrisdale area of the Hudson River.Well, there are too many discrepancies like from below, Granville Bridge looks very much different.There is another area near Main Street in Vancouver called Chinatown where similar asian events take place but when I was there it’s their version of Tin Pan Alley called ROBSON St. is what I love the most and it’s where I hang around most of the time. It’s close to cinemas, and their public library. (Click Hypertext for pictures)It’s also close to Stanley Park. It’s a good thing you have everything in place and the life you are living now is great as you deserve it. And I know too that you miss your family here in the Philippines a lot. I’ll give you a ring anyday now so expect it my friend….reverse charge ha? Ngek! I am just kidding. Anyway Iggy(Dante Rivera) send me an e-mail too. Georgie was never blurted by Dante Sumaoang before, but it’s you who oftentimes call me that then.NGEK! Sumaoang calls me Budsky! Your group(Rivera, Sumaoang, Tubay, Bumagat,etc.) is my second “cliche” in college after the “Waiting to Exhale” group of Joseph Dela Cruz, Harry Alimurong, Ramil Lambinoand I. And after your group was the veterans group of Francis Bunagan, Rafael Yumul, Regino Reña, John Aquino, etc. Yah, it’s all now but reminiscing… reminiscing… okay see you around the information highway and until the next CHICKA! hope you still remember me…..
You can now log-on to the account and change your account settings and password. I got a voice mail message for you on it,so take your time to open the account. Yah! I remember Eddie Macadangdang. He was my batchmate on the board exam in 1993 together with “Kimpoy”,Ariel Catacutan,Noel Patacsil, and the youngest brother of Ms.Joy Alamo-Viuya. I was supposed to take the board exam with the you,Iggy, Raffy and the rest of our ka-batch but I chickened-out on examination day. Absent was the entry on my attendance card. So I re-registered to take the exam a year later. But did you know that there is no need to pay registration dues for a re-registration. Yah! I never know that until I was on it, myself. It was 1993 pa, nung nagkita tayo sa Calamba, where you are working with a,what’s that again,is that a Korean company in Mayapa, while I teach on nearby Pansol, LETRAN Calamba. I remember Eddie and his plans to migrate in Canada at that time.He used to talk about it when he was staying in Sampaloc area during his board review while what I did was a self-review. Regarding Iggy, no wonder no one is responding on his “abandoned” e-addie. Nasa Qatar na pala. Give my regards to him okay and send me his new “communication lines” if you have them. Conversation Between George Palaganas(manilascooltalk) and Dante Rivera Jr.
Get more bang for your buck – from July 1st to 4th use Yahoo! Messenger to save 50% off PC-to-phone calls to U.S. numbers. manilascooltalk: wala akong mic dito..
danteriverajr: pero lipat ako ng Oman next week…..
danteriverajr: Ano balita sa yo…. danteriverajr: end ko na lang call, ok? danteriverajr: nai-send back ko na..
manilascooltalk: ganoon ka filtered? Kailan pa tayo makakapagsulatan? danteriverajr: picture lang naman ang dumating sa akin alang message…. manilascooltalk: bumalik yung letter mo as is? danteriverajr: ala pa naman reply mo? danteriverajr: dito pa nakarating yong messaga na isent-back mo..
danteriverajr: ano gusto mo na gawin ko? manilascooltalk: pag nag-sign off ako hintayin mong sign back ko ha? danteriverajr: ala naman kasi message..